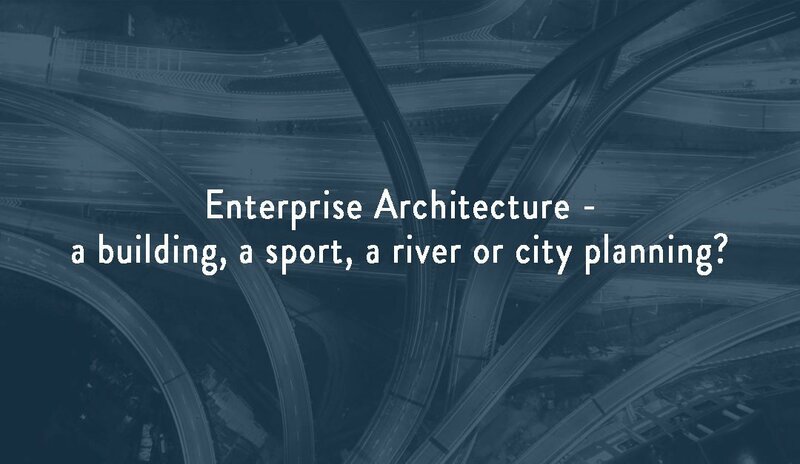 What on Earth is Enterprise Architecture? Everyone seems to describe Enterprise Architecture (EA) using a different metaphor. They all have their uses. Describing EA like a building is a reminder that coordination and consistency ensure all of the pieces fit together as intended. Sports metaphors are used to emphasize that everyone, regardless of their role, needs to communicate and work together for the team and individual players to succeed. A turbulent river reminds us that a successful large enterprise must constantly evolve in an effort to keep pace with the market and the needs of the consumer. The city planning metaphor incorporates many elements of the others. However, none of them are perfect. The business information systems and processes at large enterprises are extremely complex. Creating a complex system to organize it will create chaos. If an EA initiative wants to innovate effectively and deliver value to the entire enterprise then it must be easy to understand and explain. EA is a formalized system to ensure communication and alignment across the organization allowing for informed decision making that improves business information systems, processes, and outcomes. That is it. How? Don’t just select a popular framework such as TOGAF, Zachman, and FEAF and assume it will take care of itself. Don’t let EA sit in an ivory tower pontificating on what EA is and means to the business. Put together an Architectural Review Board (ARB) with representation from the entire business. Meet regularly and start aligning strategies across the organization. Hire experienced EA professionals that help you leverage the expertise of your team. Bring in consultants or a Chief Architect with a clear vision to help you measure, manage, and grow your EA capability into something valuable to your business.